Launching in January 2014, music and fashion icon Gwen Stefani joins OPI with the launch of 7 new limited edition lacquers. The collection has a range of colours and some new finishes. There is a boxed signature shade of red (which comes with nail art studs), two cremes, two semi-matte satin finishes in gold and black, one glittery lacquer and a chrome mirror finish lacquer ! I'm delighted to share with you two of the new shades from the collection. Love, angel, music, baby - This is the gold version of the new semi-matte satin finish, and I have to say that I totally love it. First of all, it's a perfect shade of gold. 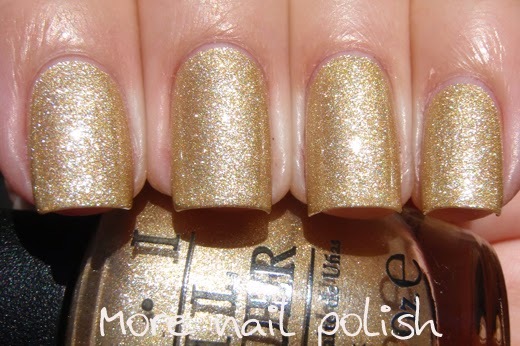 It's a champagne gold with cool undertones and a very sparkly shimmer - just the sort of gold that I love. The satin finish on this reminds me of the Layla soft touch polishes. It's silky smooth and definitely a satin finish. The base colour of this is really similar OPI Honey Ryder, and I think this pair would make some lovely nail art combos with the two different textures. These photos are two coats with no top coat. 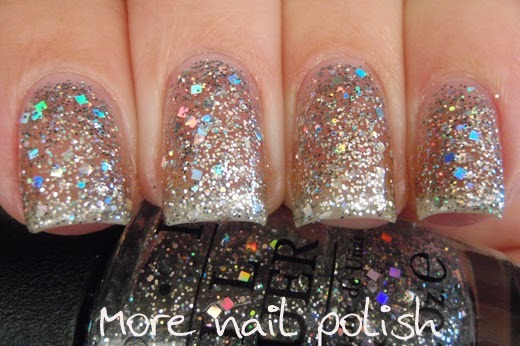 Music, angel, love, baby is intended to be worn without top coat, just like the liquid sand polishes. But just like with the liquid sand polishes, you want to see what it looks like with top coat. I found top coat darkened the finish just a little bit. I'm not sure if that is just because the satin finish disperses the light across the nail more, creating a lighter appearance though. The below photos are with top coat. Macro shot of Music, angel, love, baby in its satin state. The second polish I have to show you is In true Stefani style. 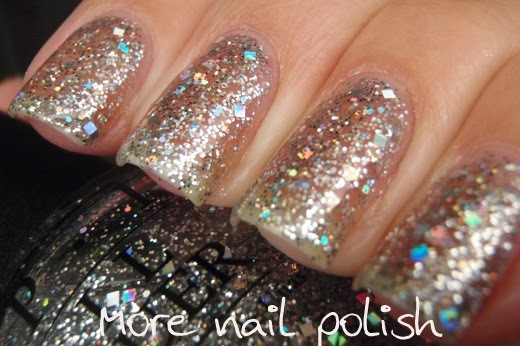 The polish has as clear base is generously filled with square holographic silver glitter and fine silver and silver holo glitter. I'm sure it's designed as a glitter topper, but the glitter payoff is very good, so you can almost wear it on it's own if you wanted. Here is In true Stefani Style at three coats on it's own. One coat over Music, baby, love, angel. One coat over Contray Polish Gift Wrap.. I'm really looking forward to seeing some swatches of the black satin finish polish and also of Push and Shove, the mirror chrome. Push and Shove is also paired with a special base coat. I can't wait to see how mirror-like it is. Woud you agree that Love, angel, music, baby is the gold version of OPI Miss universe (This Gown Needs A Crown) silver matte-satin? 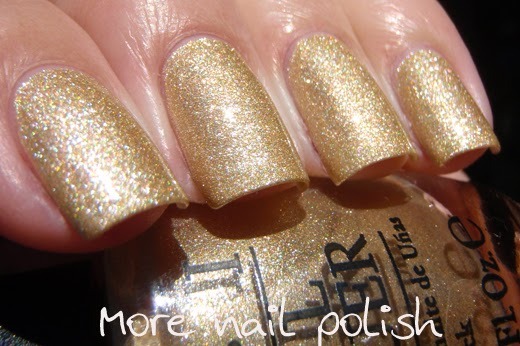 I've seen people use the silver from the OPI Miss Universe Silver for stamping, does the gold stamp as well?? I'm also looking forward to seeing swatches of the Black Satin Finish too. What is Push and Shove going to be!? Yep - This would definitely be the gold sister to TGNAC. I'll test it out for stamping, I think it would be ok, as one coat is pretty opaque - although you need to wear two to make it look good.